As you probably know, I’ve been on a soap making kick as of late. I have 175 bars in 15 scents (or unscented) that are ready, but curing. I made soap with ingredients that I look for. So getting into soaping at this level has been a bit on the pricey side. I have all of these soaps ready, but I can’t sell them for another few weeks (it takes 4-6 weeks for them to cure), and I’m running out of supplies and would like to keep making them, experimenting, and adding new products. Would you be interested in investing in my little biz with the following offer? Buy 5 soaps for $20. Shipping is an additional $5.35. The retail cost will be $5.60 + tax per bar. So you get a discount and some fun soaps, and I get a little bit more capital to buy more lye and essential oils. The only catch is that for some of the bars, you will have to wait a couple of weeks before they can be used so they can finish curing. If you just can’t wait, they can be used, but they won’t last as long because they won’t be fully hardened. If it’s a heavy olive oil soap, the lather will be weird until it finishes curing. I’m not ready to sell individual bars just yet. So this offer is only good for the 5/$20 and the offer ends 2/1/2013 2/7/2013. Some bars will be ready to use now, some will be ready by 2/15. The bars are between 4.5 and 5.5 oz which is a pretty big bar. Send me a private message to jennyfrech at gmail and tell me what bars you would like, and then send a paypal payment of either $20 if you are close and will pick up from my house or $25.35 (and your shipping address) if you live far from me. If you plan on picking up, you can pay me in person too if you’d rather. Real cold-process soap is made with lye. When you get the soap, the lye has gone through a chemical reaction with the oils to form soap. The stuff you buy at the store, both body soap and shampoo is really detergent. Even when you try to buy natural shampoos, there are still lots of things you can’t pronounce in them. In real soap your first grader can read the label. My soaps all have nice lathers. They leave your skin feeling soft and moisturized. I’m most excited about the shampoo bars. I’m using one after just a week of curing, and I love how soft my hair feels. It cleans it without stripping all of the oils out. Huzzah! What Isn’t In This Stuff? First and foremost, I don’t use any palm oil. Even many soap makers that make natural soaps use palm oil. Palm oil is very unsustainable. It comes from the rainforest in areas that have been slashed and burned, pushing out habitat for chimpanzees. Second, I don’t use any GMO products. I don’t use any corn, soybean, or canola oil (including vegetable shortening). These are the crops that are most likely to be Genetically Modified. Plus I hate Monsanto. Grrr. I don’t use synthetic fragrance oil or coloring with very few exceptions. What Yummy Things Go Into the Soap? So, what do I use? 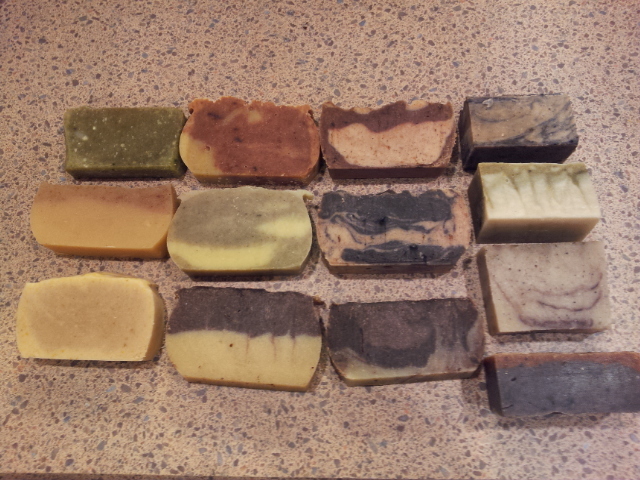 All of my soaps are made of at least 30% Olive Oil or Olive Pomace Oil. All of my soaps have coconut oil. Coconuts are harvested from trees that are viable for 30+ years. I also use smaller amounts of oils like shea butter, avocado oil, sweet almond oil, grapeseed oil, rice bran oil (non-gmo), castor oil, and cocoa butter, depending on the recipe and what it’s trying to accomplish. I use essential oils almost exclusively (with the exception of a few things like Jasmine which would be cost prohibitive). I use nice botanicals like dried calendula petals (so gentle and good for your skin), hibiscus flowers (good for your hair), chamomile, dried hops, dried kelp, rose hips, spirulina, spearmint, poppy seeds, lemon peel, orange peel, lavender petals and rosebuds. The soaps are colored with natural ingredients like cinnamon, cocoa powder, kelp, spirulina, rose hips, paprika, and tumeric. Milks and/or teas go into all of my soaps. I just love the creamy lather from these soaps. Depending on the recipe, I use goat’s milks, buttermilk, almond, coconut, or rice milk. I also use green tea, jasmine tea, and hibiscus tea in some of the recipes as well. If you are ready to take the plunge into real soap, here is the list of soaps that I have available. I’ve been making small batches so far, so the quantities are limited. If you want vegan, the ones with asterisks are the ones that use goat’s milk or buttermilk. None use any other type of animal product. You could choose all 5 of one type, or mix and match. This offer will be good until February 1st. I live in a really awesome town. Many of my readers are from Goshen, and know what I’m talking about. For the rest of you, you’ll just have to take my word for it. I’ve lived in several places in Indiana, Michigan and Tennessee. Goshen is by far my favorite place to live. 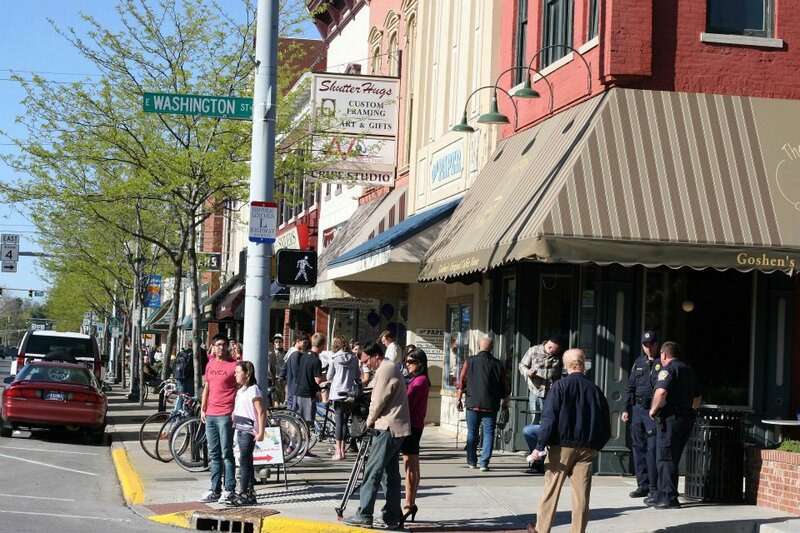 Goshen is the right mix of hipsters and homebodies; progressives and conservatives; and ludites and techies. Goshen is home to Amish, Mennonite, Hispanic, and other communities. Elkhart County is home to creative folks including artists and entrepreneurs. We have a vibrant artist community with guilds for pottery, jewelry, photography, painting, and woodworking. We have a rich culture. While our economy was in the dumps during the recession, Goshen was growing it’s downtown with tons of new stores opening up on Main Street. How many communities can say that? I am not a rat. Here’s what I really love about Goshen: We aren’t in a rat race around here. People always wave you on at four way stops–sometimes to the point of ridiculousness. What’s so great about that? It’s a symbol of being neighborly, friendly, and kind. When you wave on another car, you aren’t judging their political position, their race, their religion, their gender, their job, their place in society. You’re just being friendly and putting someone else before yourself. I like that people around here are okay with losing the five seconds that it takes to let someone else go first. So, my friend Claudia and I have been talking some about social capital. Claudia explained to me that social capital is the value or benefit that communities gain from cooperating and supporting one another. There are two types of social capital: bonding and bridging. The way I understand it, is that bonding is within groups that already have something in common. Claudia and I became friends as we carpooled together, ate together, and shared recipes. We are friends and have the bonding type of capital. The value here is that we know we can count on one another. I watched her dog one day while she was out of town. When she wanted to immediately make up for it, I said don’t sweat it, because friends give and take. Sure enough, we had dinner at their house a few weeks later–social capital. The other type of capital is bridging capital. Bridging social capital is when groups of unlike people come together, give and take, and find common ground. Goshen has a variety of rich cultures represented, but we are often floating around in our own inner circles. Bridging capital is waving on stranger and putting them first. Since Claudia introduced me to the idea of bridging capital, I’ve been intrigued. I keep trying to think of more ways to bridge the communities within our community. Each community has a richness to it. Our community is already pretty great. Imagine what it would be like if our micro-communities started sharing our strengths with one another. We’ve already proved that we are a resilient community as we continued to grow together through a recession. But there were still people hurting and isolated–and that hurts us all in the end. What would this community look like if we start reaching outside of our comfort zones? What if we invite an English as a second language speaking neighbor to dinner? What if we help a neighbor rake his yard even though there was an opposing political sign out front? What if we find questions to ask people when we first meet that don’t depend on their job or status and cut to who they are as a person? What if we take time to listen? How can we be intentional of expanding our own social groups to include others that aren’t exactly like ourselves? This way of looking at the world has been kind of fun. In the last few weeks since Claudia and I had our conversation about social capital, I’m finding myself slowing down and listening to others. What do you think? How can we build social capital in our communities? I’d love to hear your thoughts. May I Ask, How’s It Growing? 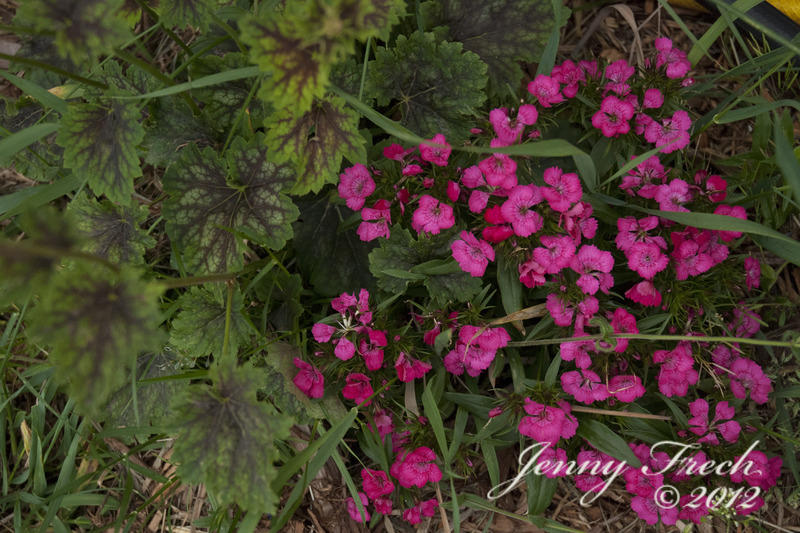 Each evening, as the sun is lighting my garden at it’s prettiest, I wander around my garden to see what’s blooming. And I talk to my flowers. The rest of you probably just think that’s crazy. It is. For those of you that talk to your plants, I thought you might like to see what’s growing in my garden this week. 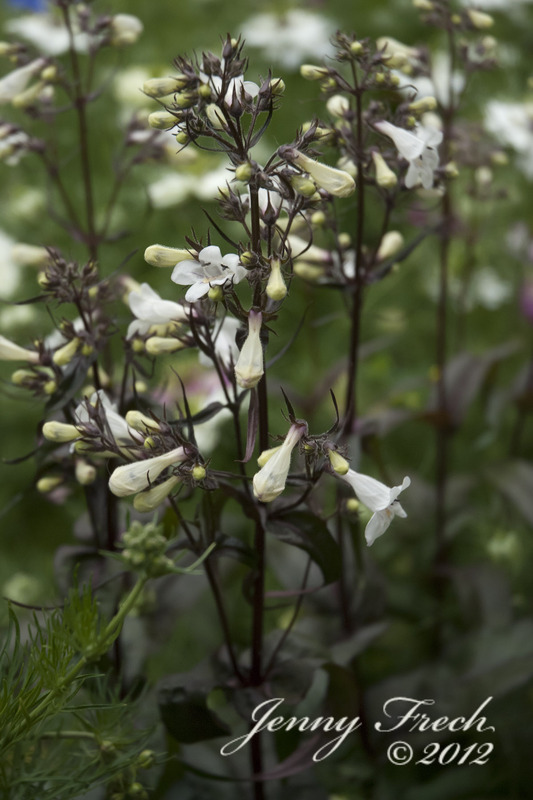 Burgundy Penstemon a.k.a. beard tongue: These bloom for quite a while. Penstemon are native to Indiana, but these are a cultivar. I like the foliage, and each year I’ll have a couple of baby plants from them. I deadhead very little because I like free plants. 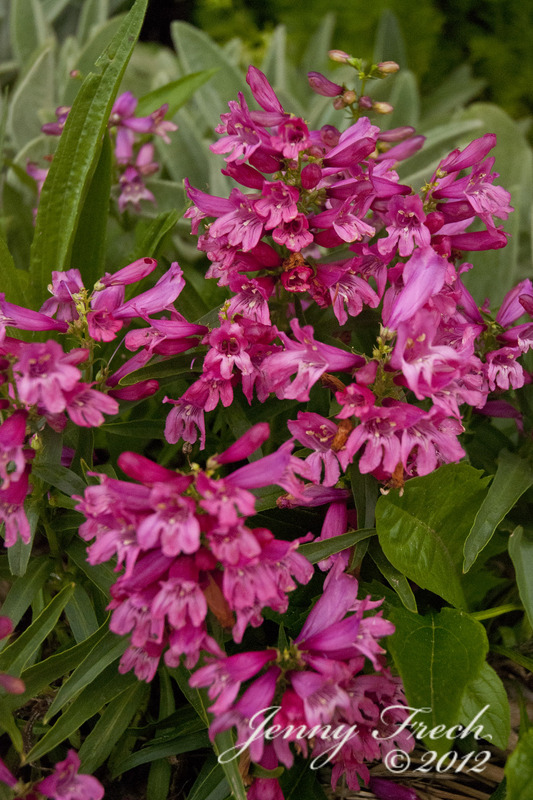 Pink Penstemon: This is a short cultivar of penstemon. I love the hot pink blooms. Anyone notice the dandelion? Dianthus: This is some sort of dianthus or pinks, although, I don’t know which one. It sort of looks like Sweet William, but it’s short. To the left is a coral bell with unusual leaves. Growing through the plant is grass. I guess I have some weeding to do. Campanula rotundiflora a.k.a. 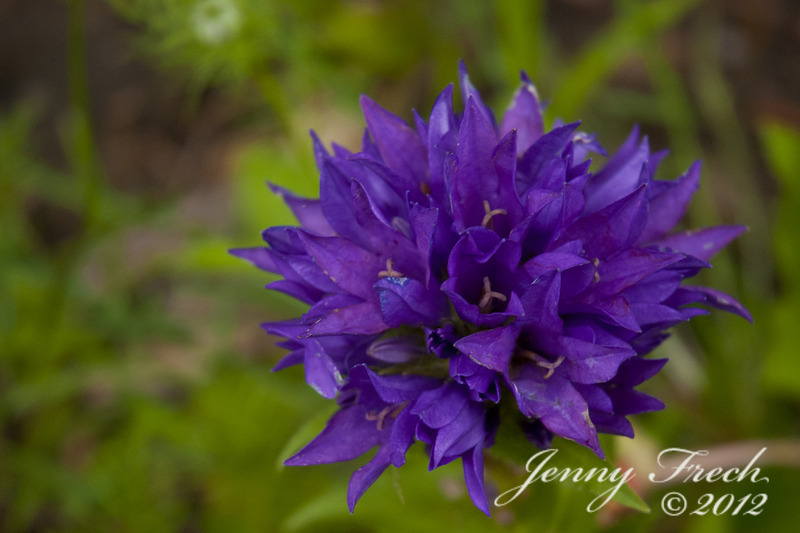 Harebells: Native to North America. Last year I split them so I have them in several places in my front bed. They are light and airy. The background blurry flowers are stock, an old-fashioned annual. 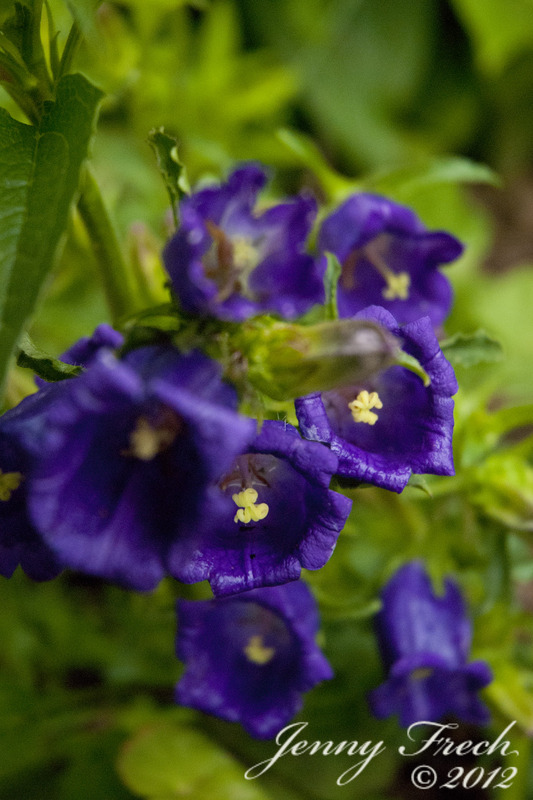 Another campanula, this time, Canterbury Bells. They come in a variety of colors, but I have a thing for purple. 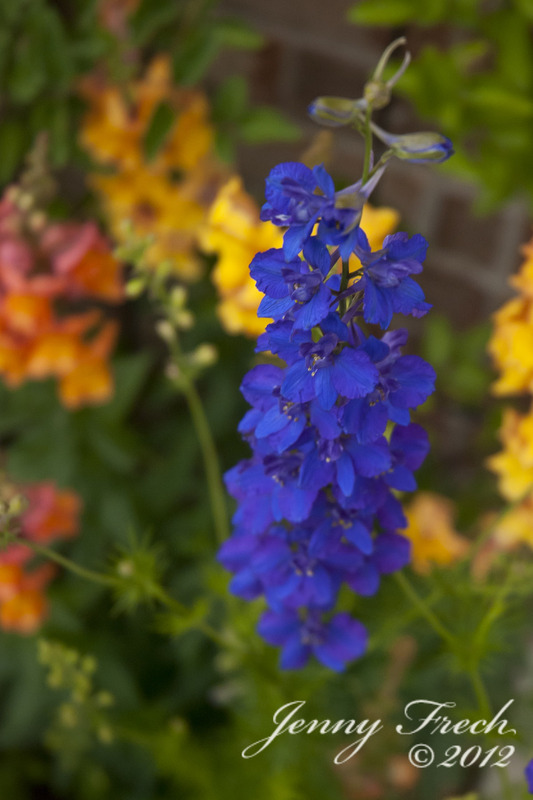 Larkspur: a reseeding annual related to the perennial delphinium (they’re in the same genus). Mine have gone crazy in the garden, but I love them! This year, they are about 3 feet tall and are just starting to bloom. 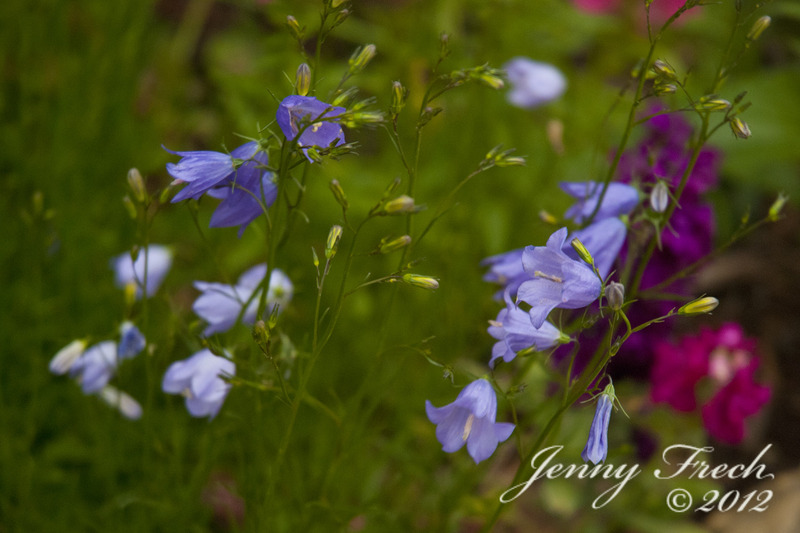 I’ve decided to stop trying to buy delphiniums, and just let the larkspur take off. There’s only one thing not to love –they are poisonous, so don’t plant them in a field with grazing animals or if you have curious toddlers. In the back are sherbet colored tall snapdragons. 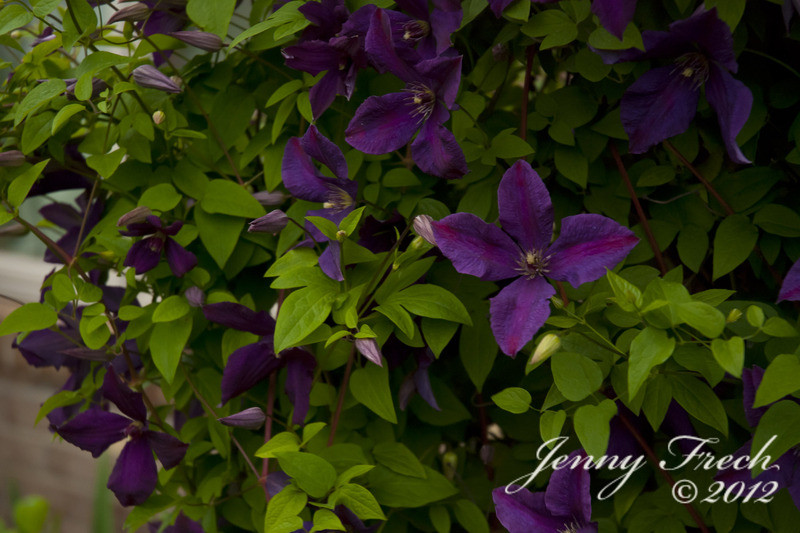 Jackamani Clematis: huge, purple, and prolific, this thing has climbed all the way up the front post on my porch. I love it, but make sure it has room. Apparently the trick for clematis is shaded roots and sun on their leaves. 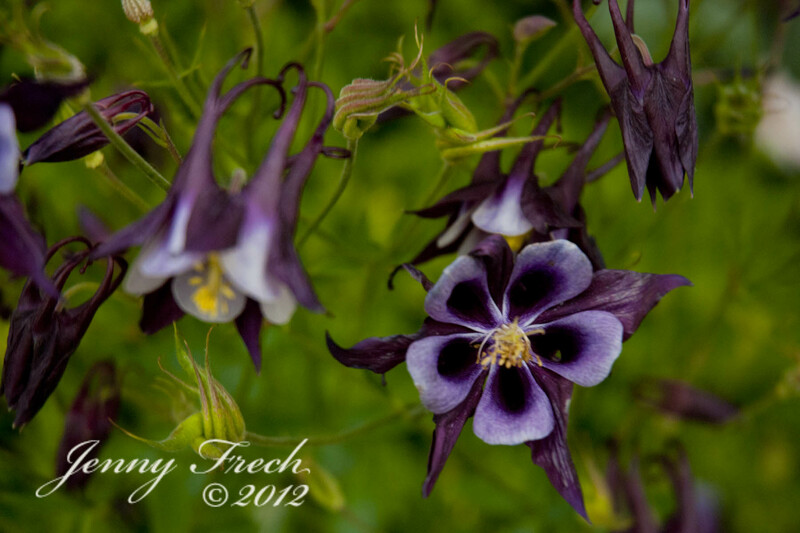 Purple Columbine: I posted this flower last month too. It just won’t quit! It’s about 3 feet tall. A section of it that I moved this spring is only about 18 inches high. The flowers are about 2 inches across. It’s very large for a columbine. This rose is an early birthday present from my folks. It’s a beautiful David Austin Rose called Carding Mill. 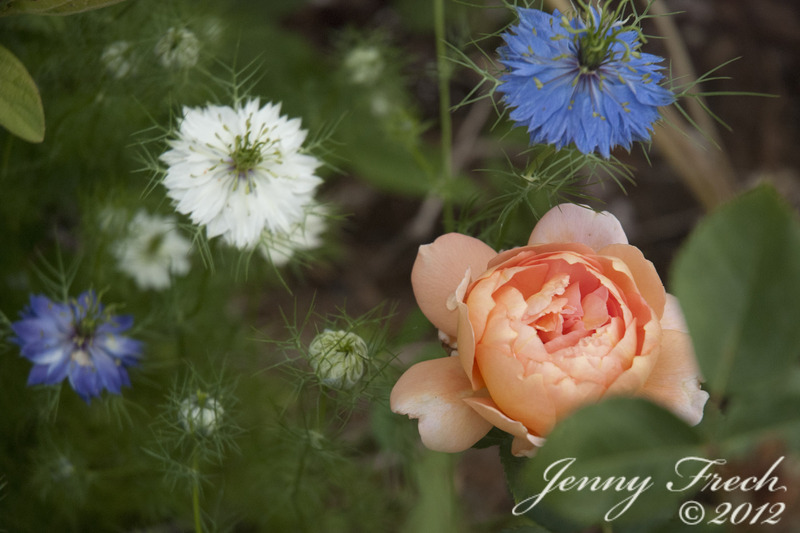 The deep peach with blue love-in-a mist (nigella) are just spectacular. Last fall I was going through a lot of soul searching about job stuff that I couldn’t really post publicly. It was all consuming; which explains why my blog has been dry for so long. I tried to write some vague posts, but they were bland. My friends and family listened to my decision making process, but it wasn’t the type of thing that I could alert my boss or coworkers to at the time. I’m in a different (and better) spot now, and I’m more free to share some of the struggle from last fall. The struggle of “what the heck to do with your life” is universal. I’ll share now what I can, in hopes that it makes someone else feel not as alone. This post was written back in November. The Cylons spent most of the Battlestar series trying to figure out what it means to be human, just like us humans. (This is not a photo of me, just in case you were wondering). I’m almost 20 years out of high school, and I think I’m finally coming to terms with what it means for me to be human. It’s not my job, or my hobbies, or my family, or my wealth. It’s about a balanced life. About a week ago, I went to the doctor. She said that I was about 30 pounds overweight and that I should exercise more. I almost cried in the office. I feel stretched so thin (that’s a stupid phrase because when I’m stretched and stressed, I get fat) already, how on earth would I find time to go for a walk? I spend almost 2 hours a day commuting back and forth to work, and another 2-4 hours per week, taking my daughter back and forth to her dad’s house. There is laundry and cooking and gardening and pets and helping with homework and trying to get a small business up and going. Meanwhile, my house is falling in around me. I don’t have time to clean, take my car in to get fixed, or even time to stop to get a haircut. Sounds like lots of people you know. I’m sure. I’m not alone. I could cut out some things I suppose. I could buy some frozen meals or give up gardening. But those are the things that make me human. I can’t cut those things out of my life because they strip away who I am. Listen friends! I’m stamping my feet now and throwing a mid-life tantrum. I want…I want…I want my life to be in balance! I want time to cook and clean; time to garden and freeze the food I harvest. I want to help with homework and comb my daughter’s hair before school; to take the dog for a walk and sip hot chocolate in the evening with my honey. I want to find a way to make some money to pay bills, and be home when the kids get off the bus. My husband says I’m greedy. But I’m greedy for time with the ones I love. I’m greedy for wanting time to connect. I’m greedy for wanting to spend time doing the things that make me human. The last two weeks, I’ve started living more like a human. I’ve been making time for some of the most important things. But, it’s reshaping the way my life is going to look. This may mean some financial changes, which can be sort of scary. But I like finding out that this Cylon might just be human afterall. I am back in the heirloom tomato plant business. 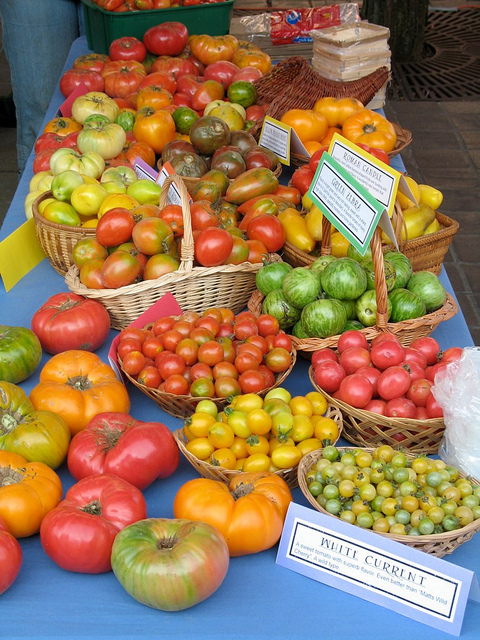 Years ago, when I had my farm, I grew about 50 varieties of tomato plants and fruit for the farmers market. Even since selling my farm, I always seem to start too many plants for myself. Also, this year, Prairie Farm won’t be selling heirlooms as she has closed her business. Hopefully, this will fill a gap for some of the Goshenites that love a good heirloom. The plants are off to a good start, and I’ve been doing a lot of transplanting. Some of the varieties are very limited quantities. I may even have a few pepper, broccoli, and brussel sprout plants as well. I’m taking pre-orders. Some of the varieties I have fewer than 20 plants. So if you want to make sure to get what you want, you’ll want to pre-order by April 15th. The cost is $2.50 per tomato plant. If you buy 10 or more, it’s $2.00 each. The other veggies will be $2.00 per 3 pack. To pre-order, send me a message jennyfrech at gmail dot com. You can either specify what type you want or send me your qualifications for plants (ie. 2 cherry plants for pots, 3 yellow slicers, and 5 good sauce tomatoes) and I’ll pick out some yummy ones for you. I’ll transplant your order for you, and it should be ready by the first week in May. You can pay when you pick up. I am also open to bartering if you have an idea for a trade, let me know. Here are the varieties I have this year. All of them have information online if you need more information. ** means that these are in very limited quantities. Just a few of my tomatoes from my farmer's market days. I’ve been inspired to write by Single Dad Laughing and his post, “I’m Christian, Unless You’re Gay.” Go read the post and the follow up responses, and then come on back. The premise is that it doesn’t matter if you people are different or we disagree with them, that we should just plain love them. We should stop throwing negativity at them and start loving them. That’s what Jesus would do. Not of being unChristian to homosexuals, or the poor, or the disinfranchised. I’m guilty of hating the haters. My hackles go up when I hear a snotty tone of voice. My patience wears thin when I hear biggotted jokes. I feel like punching a wall when I hear small minded comments. But, really, all of these people are hurting too. Or maybe they just don’t understand the power of their words. Shouldn’t I show them a little bit of kindness? Be a friend? Or at least be a good example? When I was in Junior High, I went to school in a very rich district. The right clothes and hair were very important, and I was teased a lot. My only “friends” were the other kids that were also the outcasts. We had little in common, except that we were all weirdos. Those words completely changed my life. I’ve always been very shy, and I continue to be an introverted person. But it certainly changed my perspective on other people. It’s my own fault if I don’t reach out to others. It’s not their responsibility to reach out to me, it’s mine to reach out to them. Not only that, it’s my responsibility to be receptive to the love of others.